As Hurricane Joaquin heads towards the Bahamas and threatens to soak parts of the U.S., storm stocks are surging. The storm was upgraded to a Category 1 hurricane on Wednesday morning, packing winds of up to 85 miles power hour. It is currently tracking towards the East Coast of the U.S., although its final path is difficult to predict at this point. Hurricane Joaquin is already making waves on Wall Street as investors bet that some companies will capitalize on storm preparation and possible cleanup efforts. Shares of Generac (GNRC) soared 9% on Wednesday, crushing the broader stock market's gains. The company makes portable generators and power washers for homes and businesses. Generac has a history of popping on storm headlines, including during last January's infamous Snowmageddon and following Superstorm Sandy of 2012. Generac is a relatively small company -- the market cap is just $2 billion -- so it's susceptible to dramatic stock swings. Owens Corning (OC), which makes roofing materials, saw its stock rise 4%. Water treatment company Flowserve (FLS) also rallied 2%. Home Depot (HD)and Lowe's (LOW) also outperformed the rest of the stock market, though companies are so large that it would take a massive boost to move the needle in overall sales. Plus, the 3% gain at Lowe's probably got a shot in the arm from a price target upgrade by Credit Suisse. 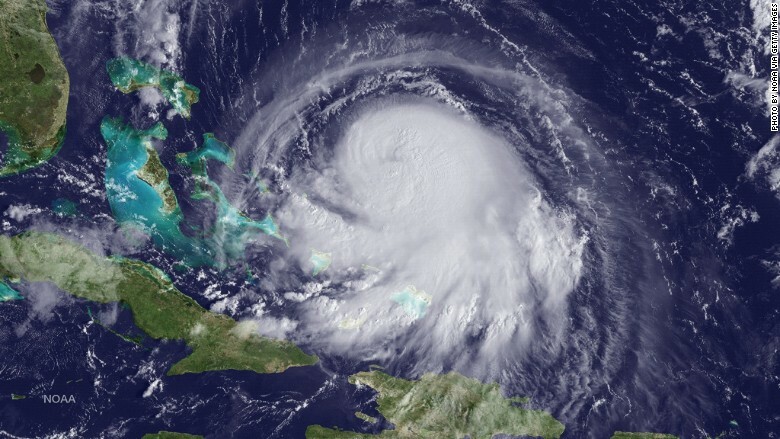 Hurricane Joaquin is expected to move near the central Bahamas Wednesday night and Thursday, according to the National Hurricane Center. It could reach the East Coast of the U.S. on Sunday or Monday or the storm may veer off into the Atlantic Ocean.